It’s the largest and only island that has more than 15,000 inhabitants. Also, it is one of those frequented islands where the number of tourists is higher than the local. In fact, the Greece Tourism has been a key element of the economic activity in the country. The enormous cliffs of the islands were formed by its active volcano, and no other volcanic creation on earth can match Santorini for its sheer beauty. Besides just walking around and taking pictures, and relaxing on a balcony with the most amazing view, we provide you with a set of other things that you can experience only in Santorini. If you want to avoid the crowd, then you should head to small picturesque villages in Santorini. There’s not much to do in all these small villages, but you can spend time walking and appreciating the sheer beauty of villages of Imerovigli, firostefani and Oia. Each village has its own charm and character. You must have seen those beautiful postcards with a spectacular view of white-washed buildings with a blue dome-shaped rooftop. Ever wondered which place is it? Well, its none other than the amazing Oia, most of the pictures are taken here. It’s one of the most picturesque places in Santorini. 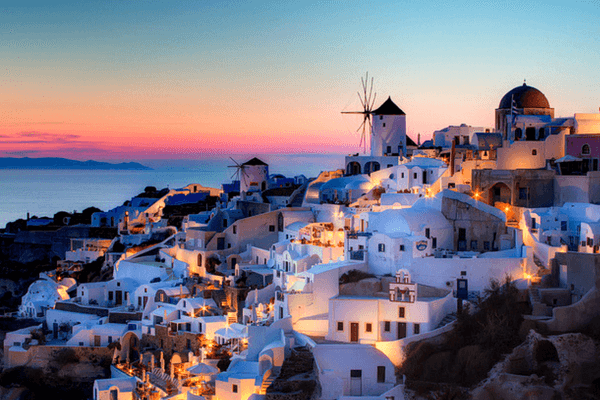 So, if you want to make the best of your Greece holidays, then you should head there, as the stunning sunset make Oia a sight to behold. But make sure you reach there by morning or else by early afternoon because the crowd gathers by late afternoon. Are you up for a little adventure? Then head to Fira. If you are someone who loves thrill and adventure and are moderately fit then you should definitely go here for hiking. 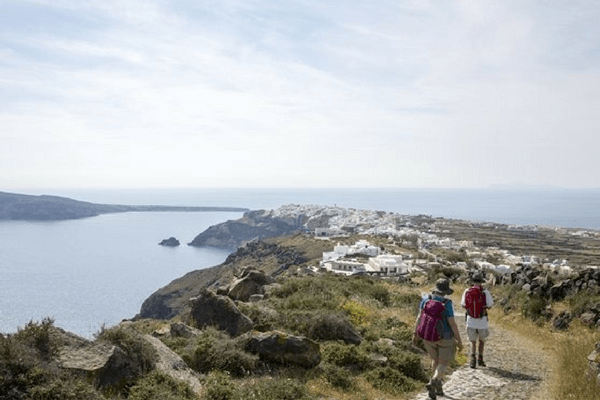 It’s a three-hours hiking from Fira to Oia. You should add this to your list of things to do in Santorini. Since it gets a little rough and difficult at some points, it isn’t recommended for everyone. But if you’re up for a long walk and wants to capture the mesmerizing beauty of the place, you should definitely take this Fira trail. And if you’re not that of an adventure buff, you can simply rent a motorbike and explore Fira, Oia and Imero. When it comes to things to do in Santorini, this place has a lot to offer to its visitors. Santorini is popularly known as a gorgeous honeymoon destination, but not many people know that its famous for its unique taste of wine as well. Vinsanto, Mezzo and Nychteri are some of the popular local wine varieties that you should try when in Santorini. It’s a heaven for wine-lovers. If you don’t visit at least one winery when you are there, then you’ve missed out on the essence of the island. Perissa is a long black sand beach on the south-east side of the island with many shacks. You can just sit on the beach and read a book as it is less crowded or else you can have a couple of beers and enjoy a luxurious experience at an affordable price. And Perissa is comparatively cheaper than Santorini’s main tourist hubs. If you are a beach bum, you can simply park your rented motorbike right in front of the sea and take a dip in the crystal clear water of Perissa. You should also pay a visit to the impressive red beach. 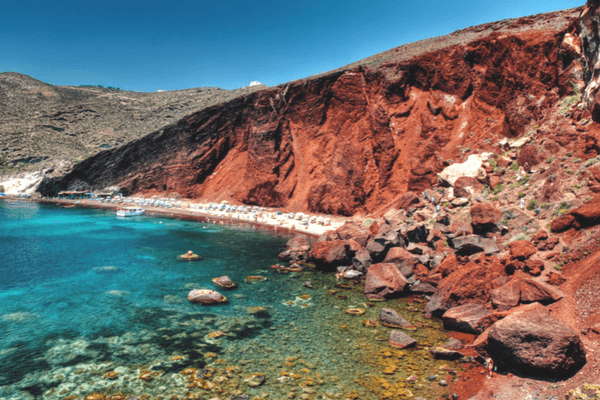 The cliffs around this beach are red and even the beach sand is red, which is a very rare sight to witness. The turquoise water with red pebbles and red and black backdrop, makes the scenery worth capturing and worth paying a visit. Also Read: Where To Go On Your First Europe Trip? The museum of prehistoric Thira is at the main town of the island. It is considered as one of the most important museums in Greece. I would highly recommend you to visit the place. 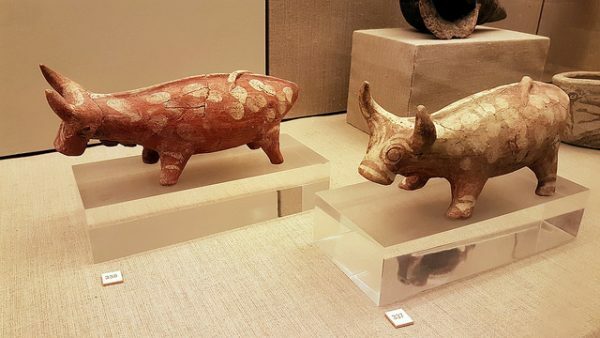 Here you could find the frescoes found in Akrotiri and you could see the elegant Minoan civilization destroyed by a volcanic eruption on display at the Museum. There are two museums, in front of the other, Archaeological Museum being the other one. The frescoes at the Museum of Prehistoric Thira are just astonishing. It gives you an idea of the sophistication of the civilization. You should add this in your things to do in Santorini list if you’re a history lover. As Santorini is becoming one of the popular destinations amongst tourists, tourism is coming up with more and more things to do in Santorini. 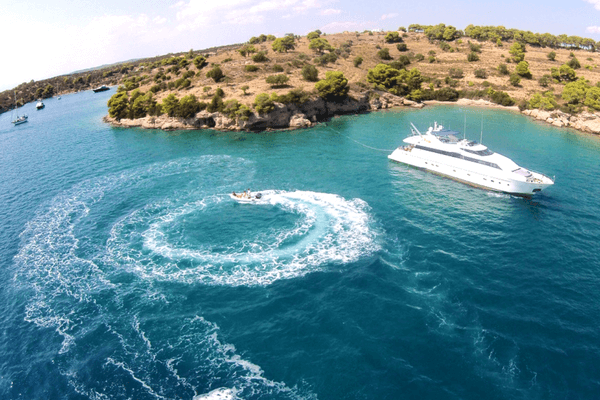 For someone who wants to experience a little luxurious experience during their Greece holiday, they should surely take a Caldera yachting. It takes you to almost all the major spots, where you could enjoy the amazing view of Santorini with good food, drinks and who knows, perhaps even swim. The major spots that the cruise covers include, Red beaches, Black beaches, Mesa Vouno, and the hot springs. You can simply enjoy the beauty of Santorini from the sea level. 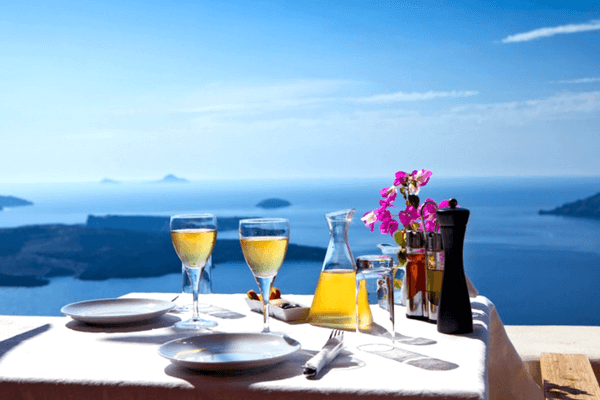 You could enjoy a romantic dinner overlooking Caldera. 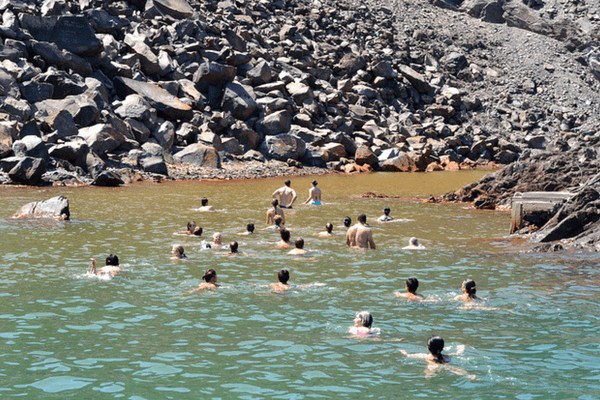 The hot springs of Nea Kameni, formed from one of the volcanic eruptions, attracts a lot of visitors all year long. The water at Nea Kameni is dark and warm as it is formed by the volcanic eruption. It is your go-to option after a tiring day, as the elements, iron and manganese, present in the water have healing properties. If you want to take a dip into warm water to relax your body then you should definitely try the thermal springs of Nea Kameni. Even though the concept of open theater has become very common these days, but imagine enjoying a movie in Santorini with an incredible weather. I would call it a perfect evening. 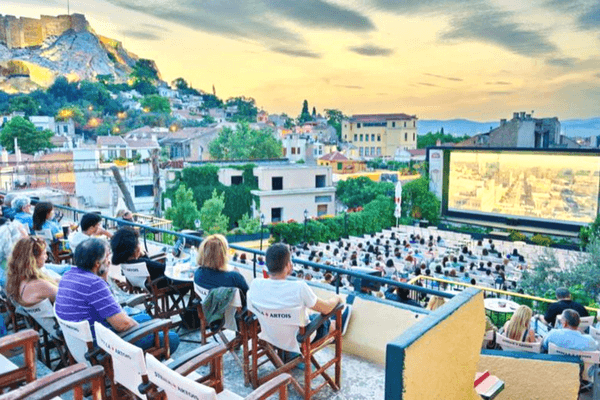 Kamari village located at the southern part of the island boasts one of the best open-air cinemas in the world. Here you could enjoy amazing cocktails and popcorn of course. 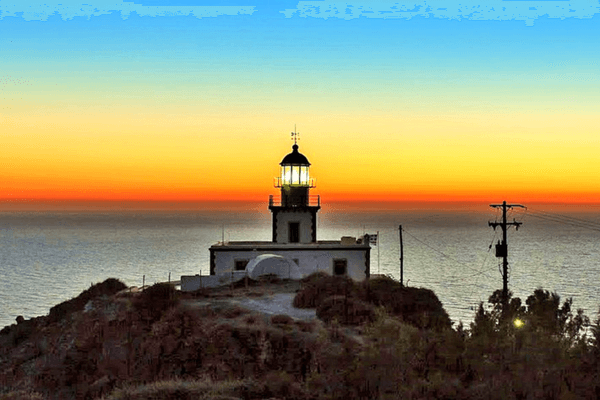 In the tranquil village of Akrotiri, you could find a well-known located lighthouse. Located in the extreme southwest part of the island, it is among the oldest lighthouses in Greece. It is not the lighthouse which is a sight of attraction for visitors, but it is the view from it. The view from the lighthouse is what brings the visitors here. It is one amazing spot to get a bottle of wine and watch the beautiful sunset view. The beauty of Santorini cannot be quite explained in words, but it is one of its kind. It will let you see beyond the tourist hustle and bustle. Everything seems created to please the eye so it will compel you to take pictures. And if you haven’t seen or touched this wonderland then you haven’t seen the beauty yet. So, what are you waiting for? 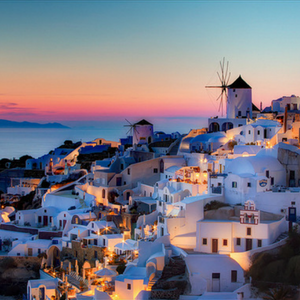 We provide you with a long list of things to do in Santorini, so get ready and book your Greece tour package right now. 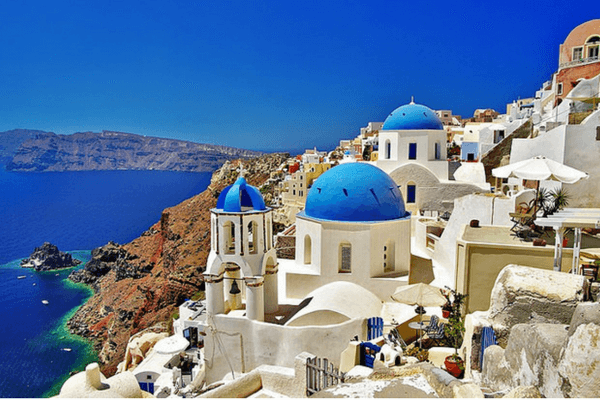 If you're planning a trip to Santorini, the most beautiful archipelago in Greece island, then here's a list of things to do in Santorini during your stay.